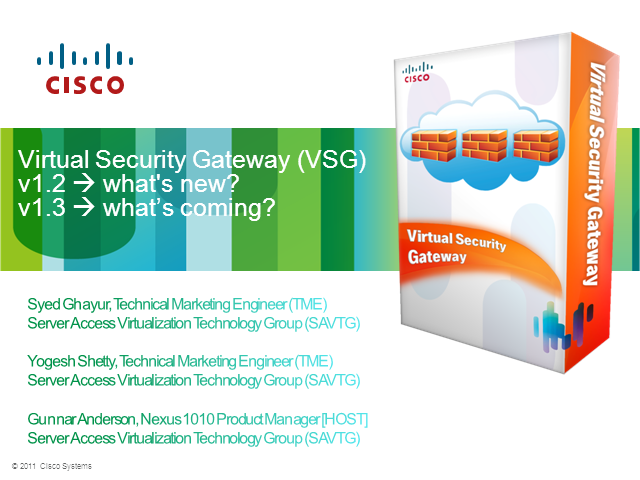 Virtual Security Gateway (VSG) v1.2 - What's New? In this webinar you will learn about the latest new features and benefits of the Virtual Security Gateway (VSG) v1.2. VSG is now available as a virtual blade on the Nexus 1010 Virtual Services Appliance. v1.2 now supports expanded VM attributes for security policies. These enhanced capabilities equip security admins with more arsenals to enforce security and compliance in a virtualized environment based on VM attributes such as the host names and resource-pool names. Title: Virtual Security Gateway (VSG) v1.2 - What's New?